Machine Learning is a technologically evolved tool which utilizes machine intelligence to capture the untapped areas of business models. We at GoodWorkLabs recognize Machine Learning as one of the pinnacle problem-solving techniques for emerging and established businesses. Our expertise at Machine Learning helps businesses tap into the vast and unexplored reserves of unprocessed data and make informed decisions from them. Be it data mining, deep learning or analyzing or processing raw chunks of information, we can help you set up a formidable fortress of data supremacy. Machine Learning is an essential embodiment of Artificial Intelligence. It deciphers and builds algorithms that allow computers to learn how to perform tasks from existing data. This reduces the workload of a programmer and enables him to focus on core tasks, rather than writing complex codes for the same. Machine Learning analyses previously available data and scans through millions of examples to come to a conclusion. With this intelligence, machines can understand complex patterns and predict outcomes to situations more accurately. At GoodWorkLabs, we use deep learning, natural language processing and neural networks that can replicate human decision making and allow real-time applications of Machine Learning. Below are the possibilities that you can extract with machine learning. 1. Image tagging: The Machine Learning algorithms can identify faces or specified objects in a photo based on the photos that you manually tag. This can reduce redundant tasks for manual data operators. 1. Predictions: Banking sectors can use this to analyze the creditworthiness and probability of loan defaulters. Other applications include trading, building predictive models of prices and market volatility, portfolio management and risk management. Machine learning algorithms help to draw insights and predictions from the huge sets of data. It is not just about tracking user data but presenting it in a readable manner for decision makers to make critical business decisions. Data visualization is a very important aspect of machine learning and we at GoodWorkLabs create models that help to extrapolate this critical information into easily readable and understandable formats. 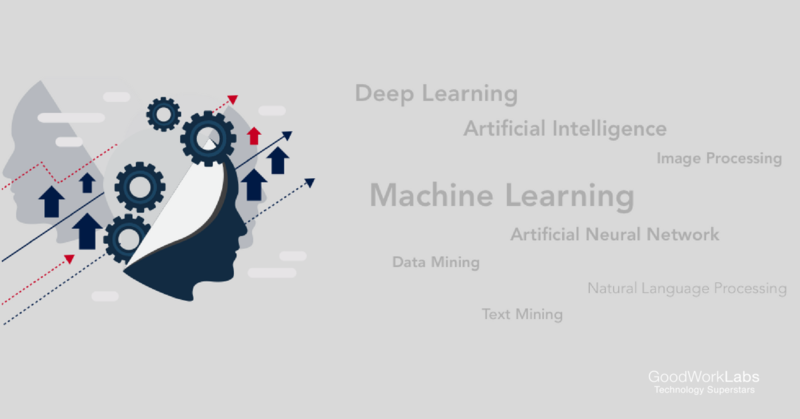 These are just some of the many benefits that Machine Learning can bring to your business, but the most important is that which gives you access to understanding tons of data at your fingertips. Talk to us today for a better understanding of Machine Learning and how it can change the way you look at your business.